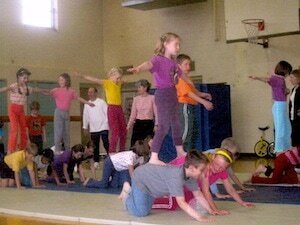 At Aurora Waldorf School, we've had an annual all-school circus since 1995. Each May as we present this event, I'm filled with thanks: first and foremost, to Jaimen McMillan and Maureen Curran, who taught the Spacial Dynamics cycle that continues to inspire my teaching career; and secondly to a book titled “Stunts and Tumbling for Girls” written by Virginia Lee Horne in 1943. The circus model I've built up over the years is entirely the result of those two sources; there is almost nothing in it that is original from me. Our movement program for grades 1 to 6 includes the typical quantity of two games/gym classes a week… but also a weekly tumbling/gymnastics class. Our rhythm for these lessons is two Tuesdays doing mat skills and agilities, and then a Tuesday with apparatus. These classes – staffed by myself and two assistants – combine two grades together, i.e 1 and 2, 3 and 4, and (depending on class sizes) 5 and 6. —> See it/Read it! 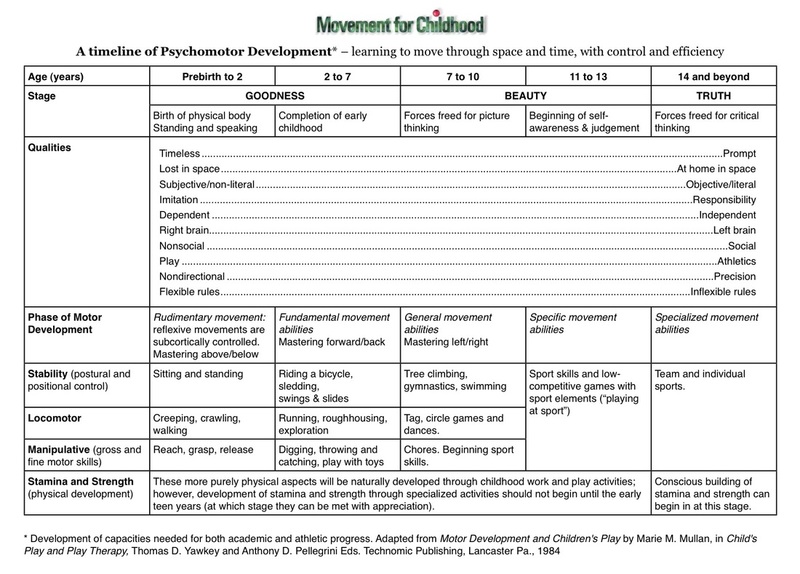 Motor Development and Children's Play - contains powerful material about developing capacities before specialized skills. —> Read it! The Young Child's Play and Social and Emotional Development - so often parents need encouragement to remember that ages birth to nine are an important window for development of right-brain skills, and that emphasis during these years on left-brain specialization can cloud this window. —> Read it! Aurora Waldorf hosts the regional Waldorf pentathlon for schools in western New York and southern Ontario. Here is a sample of the information packet we send out each year; it includes notes on competition and judging, odes, tunic designs, registration forms, etc. A developmental assessment is not a measure of skills or a test of abilities; rather, we look at the interrelated areas of development listed below. These areas represent a child’s capacities or readiness for learning. In first and second grade, we can observe the child reshaping, slowly working to change his or her kindergarten presence to a form more fitting for life ahead. Third grade (9 years old) should mark the change to a new, more individualized, presence; and a new readiness for academics. 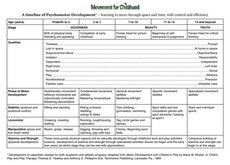 The following movements will help to promote and consolidate this important shift in developmental readiness. How much creeping and crawling does it take to prepare a child for school and life? Many child development specialists believe that tens of thousands (perhaps as many as 50,000) crawling type steps are needed to properly myelinate the brain for academic readiness. Given today’s popularity of strollers, walkers, baby bouncers, backpacks, etc. it is unlikely a modern infant/toddler will take that many crawling steps. "There is a correlation between the appearance of this activity [rough and tumble play] and the maturity of the frontal lobes of the brain. The executive functions of the frontal lobes include reflection, imagination, empathy, and play/creativity, and when these develop, they allow for greater behavioral flexibility and foresight, for well-focused, goal-directed behavior." In 1921 Fritz von Bothmer was asked by Rudolf Steiner to develop the gymnastic education at the first Waldorf School in Stuttgart. When Bothmer confessed to feeling somewhat inadequate for the task, Rudolf Steiner simply advised him to “be happy” in his work with the children. That is what he did; and gradually he evolved a series of gymnastic exercises. Bothmer did not start by imposing abstract theories onto movement. He started simply by moving. He started from the one question, “what is true human movement?” and grew from there, as we all can. In his 1914 book, "Teaching Gymnastics", Wellesley College professor William Skarstrom included a chapter on teaching and classroom management which I believe contains a treasure trove of wisdom and pointers for the teacher of any subject, i.e. not only the teacher of gymnastics, by any means. Over the years at Aurora Waldorf School, I have found it helpful to take time during the first Gym class of the year, to read and explain the following "code of conduct" to each grade, and then to make sure students know where these rules are posted. For grades 1, 2 and 3, children seem to like to know that they're going to have "manners class" right along with Gym. For older grades, the wording can be simplified but the same rules need repeating... usually several times a year. Following is the general description of the movement program at Aurora Waldorf School; this outline is provided to parents. One of the stated goals of the AWS movement program is to prepare every 8th Grade graduate with an ‘athletic generalist’ foundation of basic capacities and attitudes. We want to make it possible for any student to go on to competition at the high school level, if the desire is there. From an Editorial by Daniel Bittleston, in the Summer 1979 issue of “Child and Man”, published by the Steiner Schools Fellowship. When children’s feelings and imagination are deeply moved—by a great story perhaps—they are usually physically quite still and peaceful, and one senses that a profoundly healthy process is taking place. Teachers are, in fact, very often striving to engender in children inward activity accompanied by physical immobility. Is there an equally healthy form of physical movement? Here are instructions for eight basic string games to use as a starter program for grades 1 to 5.